Made especially for Bunco enthusiasts. This Wine glass is etched with Bunco and is a perfect compliment to the Bunco Wine. 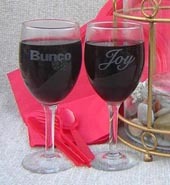 Send the name you would like on the Bunco Wine glass and we will etch your name as our gift to you. This is a special offer for the Bunco enthusiast. Order now!